Southern Illinois and the lower Mississippi Valley, the heart of French Illinois, gave way to unparalleled German migration, especially in Southwestern Illinois. Gottfried Duden's book of the Mississippi Valley, published in 1824, was widely read in Germany, and many heeded Duden's call.
. . . Belleville welcomed German immigrants and soon an estimated 90% of the city's population was either German born or of German descent . . .
Another great influence affecting German migration was the "Giessener Gesellschaft" - an immigration company that chose Missouri as its major New World destination. After the failure of the German Revolution in 1830, many of the educated by necessity fled their homeland. But preferring a free state, thousands preferred Illinois. Belleville was the center of the first important German settlement in the State of Illinois. Belleville welcomed German immigrants, and soon an estimated 90% of the city's population was either German born or of German descent. The influence of Koerner, Hilgard, Bunsen, Abend and Engleman was long felt in law, journalism, education, science and industry. It was not only the educated who fled, however. The mechanically inclined emigrated also. (Centennial History of Illinois, pub 1920 Vol II, p 391) Bornman, Braun, Gundlach, Eimer, Knoebel and Brosius were mechanical geniuses who involved themselves in all manner of community improvements. In 1870, their "smokestack industries" made Belleville the second largest producer of manufactured goods in the state (tied with Peoria and second to Chicago). Early Yankee and German industrialists contributed significantly to the industrial movement in Illinois and left their mark on local, state, and national history by establishing some of the earliest and largest manufacturing facilities and registering hundreds of patents. Agricultural machinery became a major commodity of Belleville industry after 1848 when Cyrus Roberts and John Cox opened their Illinois Foundry. 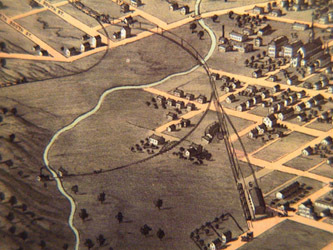 After the Civil War, Belleville was poised for production. Numerous companies manufactured nails, printing presses, gray iron castings, stoves and agricultural equipment. Entrepreneurs established the first and last brewery in the State of Illinois. On the lighter side, Belleville was the center of the leading cigar revenue district of Southern Illinois, and the company which now makes "Jelly Belly" candy was founded by two German candy makers in 1868. After the Civil War, the foundry industry gravitated towards stove casting. The Labor & Industry Museum is proud to present 26 stoves dating from 1881 to 1940, including a wide range of heating and cooking styles - all made in Belleville. The production figures and the wealth generated from the stove foundry industry has given Belleville the moniker, "Stove Capital of the World". Belleville continues to produce high-quality stoves and heating products for today's market. That industry continues today because of the quality of workmanship available in today's labor market. It is believed that industrialists of Belleville enameled the first stove in America and came up with the idea of the "Jacketed Stove". An immense deposit of bituminous coal was the impetus for railroads pushing across the state. St. Clair County alone held 400,000 acres of workable coal land. By 1874, some farmers had become coal mine operators, and 100 shaft mines were in operation in the vicinity of Belleville. One of the leaders of the area mining industry was William Brandenberger of West Belleville. Between 1870 and 1890, all railroad lines between the American East and West crossed Illinois. Chicago was the Northern terminus and St. Louis, MO, was the Southern terminus. Illinois boasted the greatest railroad mileage in the country (Cenntennial History of Illinois, pub 1920 Vol IV, p 315). Much of St. Clair County coal was used to power steam railroad engines. Many tons of coal were transported daily to St. Louis from Belleville. It was the steam powered railroads that pushed Belleville, a landlocked community, into the Industrial Era. Another mineral industry that had tremendous impact on the area was that of cement production. Illinois had large deposits of natural cement materials at Utica on the Illinois River. But artifical cement, such as Portland, was developed and challenged the natural cement industry. Artificial cement is produced by means of a process of burning limestone and clay in a kiln. James Afflec, a patternmaker, cabinet maker, architect, building contractor, alderman and assessor came to Belleville as an orphan in 1818. His son, Benjamin, became a millionaire cement magnate and served as President of Universal Portland Cement, Chicago. He returned to Belleville to attend the opening celebration of the newly paved West Main Street. Pictured is former Mayor Fred J. Kern shaking hands with Benjamin Afflec, President of Universal Portland Cement Co. Afflec, formerly of Belleville, was on hand for the dedication of Belleville's Million Dollar Concrete Boulevard on October 24, 1917. 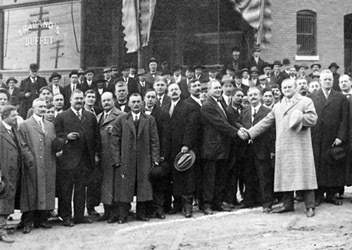 It is believed that Mayor R. E. Duvall is standing at the right of Kern. Bellevillians have always been fascinated with transportation both locally and at the state level. Subscription companies were formed to build plank roads to Lebanon, Mascoutah and Freeburg. Improved surface transportation also included electric railroads, and Belleville is credited with the inauguration of the first electric trolley in the state (Centennial History of Illinois, pub. 1920, Vol V, p 124). 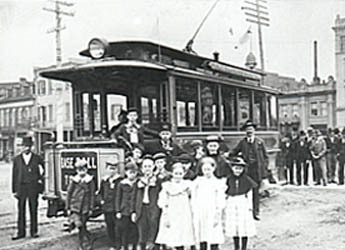 In 1889, the St. Louis, Belleville, and Suburban Railway Company opened local trolley lines which took passengers to Walnut Hill Cemetary, Douglas Hill and West Belleville. In 1818, Illinois' Territorial Period ended with Statehood. The county seat of Illinois' first county, St. Clair County, had been moved from Cahokia to Belleville in 1814. To celebrate the Belleville's Centennial in 1914, much of the early history of Illinois was written in a blend of poetry and drama. The "Pageant of St. Clair County" was written by Thomas Wood Stevens of the Carnegie Institute of Technology, Pittsburg, PA, and published at Belleville. The demand for music and song was easily met by the community which also established the first subscription library in the state and one of the first kindergartens in the country. Belleville's Philharmonic is second only to New York in continual operation. The Pageant of St. Clair County, a hard bound book of 110 pages is a prized archival piece of the Labor & Industry Museum. Check this website for future installments on Belleville's historic highlights.